Happy Friday! We are about ready to cross one month off of 2016 and by now those New Year’s Resolutions are broken and long-forgotten. Cheer up! It is Friday and time a little humor. 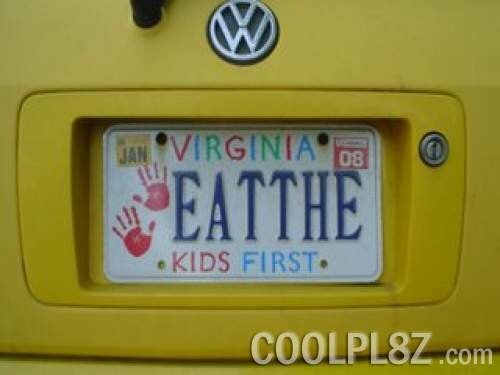 Lots of folks have vanity plates. While the accountant in me does not allow me to spend more on my license plates than I absolutely have to, I can enjoy seeing some of the more unique vanity plates out there. Here are some of my favorites. G3TSM4RT – wonder if the other car in the garage has a plate with “AGENT99” on it? HV2RUN – the car or the person? in the car or outside of the car? NVRLKBK – wonder if this is a philosophical statement or what he does before changing lanes? IH8 PPL – I am certain this driver is a little ray of sunshine! SLZBAG – do you really want to advertise this? This entry was posted in Friday Funny, Humor and tagged Vanity Plates on January 28, 2016 by Leonard.